The initial investment to get started fishing is not as big as you might think. If you’ve ever seen a dedicated fisherman’s tackle box filled with strange lures, rigging, odd-shaped weights and hooks of every kind, plus some tools you’ve never seen before at all, it can be intimidating. Here’s the stuff you need and about how much to expect to pay for it. I’ll discuss it in more detail below. When you go to buy your gear, I recommend visiting your local fishing tackle shops as opposed to the big sporting goods stores. The small shops can help you choose gear tailored to local fishing conditions and are generally better at answering questions. Not a whole lot to it! Hat & sunscreen: Don’t leave home without it, no matter what your skin tone. And put some on now while you’re thinking about it. Fishing license: If you’re shore or boat fishing, it’s essential. Most SoCal piers do not require a license. Check before you drop a line! There are lots of licensing options. Its about $45 for CA residents for the calendar year. If you buy your license on Jan 01, it’s the same price as December 31, so you get more value if you buy early in the year. 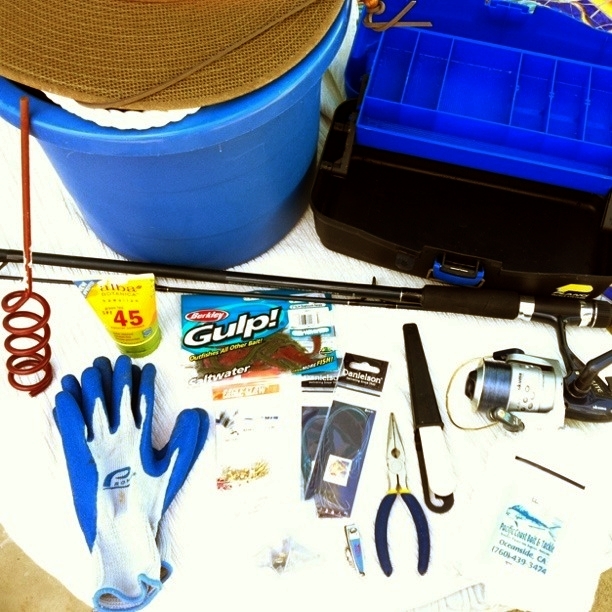 Fishing pole & reel: Basic (and worthy) rigs can be had for $30-$40. These rigs include the pole, the reel and line. If you’re surf or pier fishing, use a pole about 6-7 feet long. Some surf poles are as long as 12 feet. But you can’t use a long pole on a pier effectively. Shore & pier fishers should use 12lb test. Tackle box: Ya gotta have a place to put yer stuff! The one in the pic was $12 and is about the size of a shoe box. As long as it has a good solid lid that doesn’t pop off easy, it should be fine. Here’s some other items you may or may not need based on your preference. Hand towels: And while you’re at it, some moist towelettes & hand sanitizer in case you plan to snack while you fish. Net or Gaff: How do you lift a 20 lb fish 50 feet up the side of a pier without breaking your line? Answer: you need a net or a gaff (a large weighted hook on a rope). I prefer nets since they don’t harm the fish in case you have to throw it back. Gaffs are certain to harm or kill your catch. Sometimes the pier has a bait shop or snack bar on it with a net or gaff you can borrow but don’t count on it. If you’re tough you don’t need this stuff, but it’s handy and convenient. Chair. Unless you like sitting on the sand or the grimy benches if you’re pier fishing, a foldable chair is almost a necessity. Cart: If you do a lot of pier fishing, its a LONG walk from the car to the end of the pier. having a little cart or dolly with wheels makes it much easier to haul everything around. I found one at a nearby grocery store for $10 (!) and it holds everything I bring. That’s it! That’s everything you need and then some to get started. Now go catch dat fish!